Being a New Zealand bank, it was only appropriate for us to select the yellow-eyed penguin since it appears on the New Zealand $5 bill. Click here for The Co-operative’s Bank Yellow-eyed penguin video. Let’s be honest – it takes something special to make it onto one of the nation’s most popular pieces of paper. Like The Co-operative Bank, the yellow-eyed penguin is small in size but has some very unique features that set it apart from other birds. 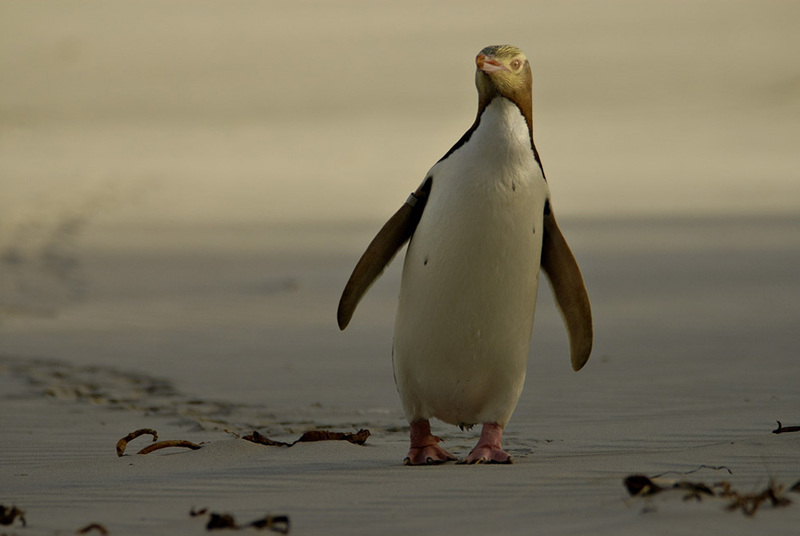 So what can we tell you about the little yellow-eyed penguin? The yellow-eyed penguin is one of the world’s rarest penguins with a population of just 6000-7000. The population took a hammering in 2004 when an unknown disease killed 60% of the chicks around the Otago area. Any further outbreaks could have disastrous consequences. The yellow-eyed penguin grows to a height of just 65cm and can weigh in at up to 6kgs. Parents forage for food for themselves and their chicks and can travel up to 13km offshore and up to 17km from the nesting site daily. They’re early risers – setting off at dawn and returning at sunset during chick rearing. At other times they can spend up to three days at sea. They are fantastic swimmers and can dive to depths of 160m to catch fish. Yellow-eyed penguins are shy and, unlike most other penguin species, they do not nest within visual sight of each other. Although they often come in from the sea together, they’ll always disperse along the way to nests away from other penguins. Penguins generally lay two eggs in September, and these take 39-51 days to hatch. Chicks are guarded for the first six weeks by one of the parents. After this time both parents will spend time at sea looking for food. The chicks fledge in mid-February and are then totally independent. Penguins first breed aged three to four and long term partnerships are formed. Yellow-eyed penguins can live for up to 24 years, however, they struggle to survive due to natural predators and introduced stoats, feral cats and rats that eat chicks and their eggs. People have destroyed much of their natural habitat on land through development. By giving your vote to the cute little guy who wobbles along and adorns our $5 note, you’ll be raising its profile as an endangered bird of New Zealand and helping it to win the precious title of Bird of the Year. Click here to vote for the yellow-eyed penguin.